A narrow mangrove-lined river rings around Khao Daeng and makes for a pleasant morning or late afternoon cruise. Browse places to stay in Khao Sam Roi Yot National Park on Agoda.com. Free cancellation. The trip takes around 90 minutes, going in a semi-loop around Khao Daeng and other striking rock formations. You’ll also pass through a mangrove forest where crab-eating macaques can be seen munching away at low tide. A wide array of birdlife can also be spotted, especially around sunrise and sunset -- don’t forget those binoculars. The fare for a 90-minute cruise is 1,400 baht for the entire boat, so it becomes quite affordable if you can rustle up a crowd. Boats comfortably carry eight people. If you ask nicely, the driver will also take you to the mouth of the river. 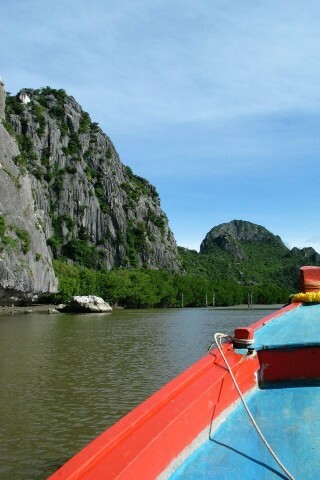 Boat tours of the surrounding islands can also be arranged up at Laem Sala and Phu Noi.